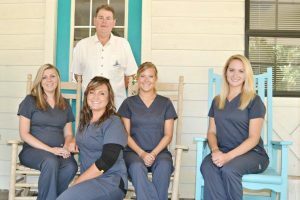 Dr. Whiteman welcomes you to our dental office in the beautiful historic town of Apalachicola. My team & I are dedicated to our patients complete dental needs. New patients are welcome & we treat same day emergencies. Dental Cleanings, Fillings, Crowns, Implants, TMJ & Headache Therapy (Botox), Dermal Fillers, Root Canals, Tooth Whitening, Veneers, Oral Surgery and B-12 Injections. Dr. May enjoys working with patients of all ages, he offers general dental services for you and your entire family. Dr. May and his staff are known for their exceptional chair-side demeanor. Dr. May also offers the most popular cosmetic procedures such as Ultrasonic cleaning, crowns and bridges, dental implants, porcelain veneers, teeth whitening and tooth colored fillings and Invisalign tooth straightening.